This scale is currently out of stock with no ETA. If you don't need a pole mounted display check out the original CM-101 instead. Pole mounted, dual sided weight display for easy viewing. Scale Size 21.5" x 13" x 13"
Class III NTEP Approved Legal For TradeThe National Conference on Weights and Measures certifies the CM 101P Legal for Trade with Certificate of Conformance Number 04-101A1. So, you can count on getting accurate readings time after time. 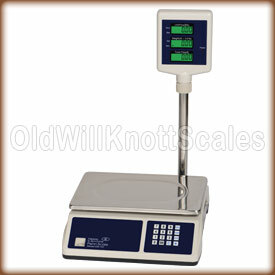 Perfect for stores and markets where items are sold by weight....Great for produce, meat and more. 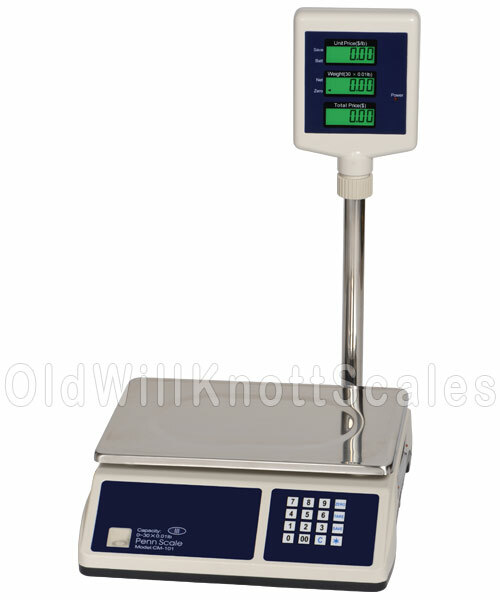 Tower Weight Display For You And Your CustomersThis pricing scale has an easy to read, double sided, LCD display that shows unit price, weight and total price simultaneously. Rechargeable Battery PackYou won't have to worry about searching high and low for a wall outlet to plug this retail scale into. The CM-101P has an internal rechargeable battery with up to 120 hours of battery life on a single charge! Three Bright Backlit DisplaysYou'll have no problem at all seeing the weight displays on this pricing scale. The CM-101P displays have a bright backlight so ya can see your weights even in dim lighting. Stainless Steel PlatformThe CM101P has a durable stainless steel weighing platform to make cleanup a breeze. Unlike gold or silver, stainless steel doesn't scratch easily and keeps its shine without rusting or tarnishing. Easy To Clean Membrane KeypadYou won't have to worry about dust and dirt getting stuck under and around this scale's buttons...The CM101P has an easy to clean membrane keypad with accurately labeled keys for easy weighing.